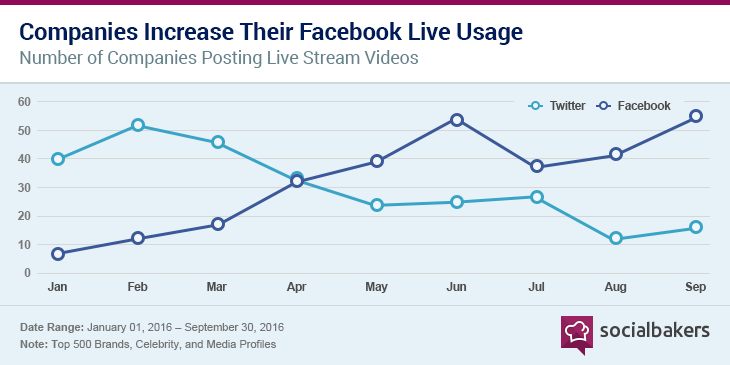 Facebook Live is quickly gaining traction with mainstream audiences, reaping higher engagement levels and gaining the attention of businesses, marketers and brands all over. It’s rise in popularity has subsequently caused the platform to give live video content preferential treatment within it’s algorithm. This in turn brought waves of interest from the business and marketing communities who saw this algorithm update as a way to increase their reach and expand awareness of their brand’s vision, mission, activities and events. 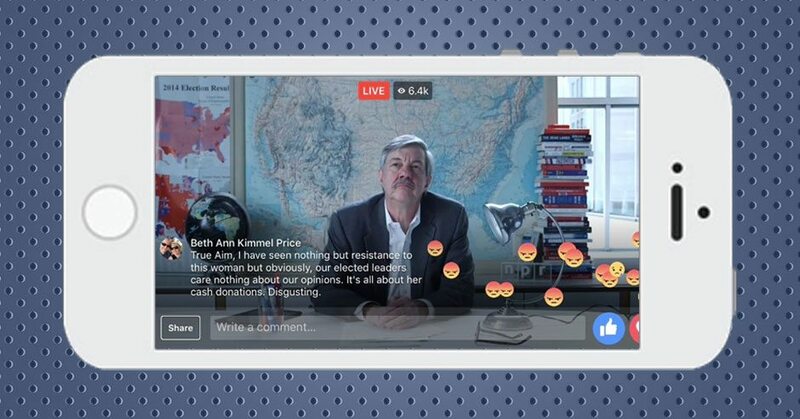 But the real reason that Facebook Live is so effective lies less in it’s preferential treatment from an algorithm standpoint and more in its inherent ability to foster more organic and meaningful connections with others. Audiences are looking for socially conscious, consumer-driven brands and brands are looking for ways to gain greater insight into their target demographic by getting on a more personal and relatable level with them. 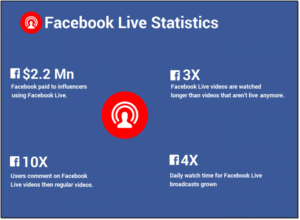 If you’re one of the many businesses out there interested in the various benefits that Facebook Live has to offer, then look no further than these next few lines. This article will detail 11 reasons why Facebook Live increases both customer engagement and brand awareness and is the best solution for your marketing agenda in 2018. 1. Facebook Live “breaks the fourth wall”. The term “breaking the fourth wall” pretty much means exactly what it sounds like it does with the proverbial fourth wall representing traditional barriers to marketing to your audiences. With Facebook Live, you’re able to look your audience directly in their eyes and address them by name, thus constantly encouraging active participation and engagement. Don’t make the mistake of using your Facebook Live event as a means for pushing one-way promotions of your brand or product onto your audience. This manner of marketing is not only ineffective with contemporary social media-driven audiences, it’s extremely off-putting. So, continually mention that you’re looking forward to answering questions and comments that are presented in the comments section so that new viewers understand that participation is not only accepted, but encouraged. Also make sure to speak directly to the camera, regardless of whether you’re holding an interview or working with a host. Keeping eye contact with the camera makes the audience feel as if you’re speaking directly to them — you’re recognizing their existence and engaging them directly. Addressing the audience by their specific names is also a great tactic to keep personalization high and being sure to include and engage even those who aren’t necessarily bold enough to speak up on without encouragement. When we ignore questions or keep individuals “hanging on too long”, it can often give them the feeling as if they’re being “snubbed” — so doing our best to keep everyone included to the best of our abilities is crucial to maintaining both engagement and loyalty. 2. Facebook Live is interactive. So, if you weren’t already aware, interactive content is kind of like the hottest new thing going around the marketing industry block. Interactive content is content that by definition, requires audience participation and active engagement more so than passively reading or watching content does. According to SnapApp, the value interactive content lies not just in it’s ability to better “educate, entertain, and engage your audience” but also in its ability to benefit the participants in return for their engagement by giving them “real-time, hyper-relevant results”. Interactive content cuts through the noise, it opens up the door for discourse between brands and their audiences in a more meaningful and organic way and it’s highly personalized real-time nature is both extremely valuable and appealing. So, what exactly constitutes interactive content? With the use of Facebook Live, you can actively engage your audience by conducting assessments, offering advice or insight, coming up with interesting trivia or even taking polls or surveys. Facebook Live gives you the opportunity to conduct everything from Q&A’s to product demos and gain real-time user feedback and invaluable insight not possible with other forms of content. 3. 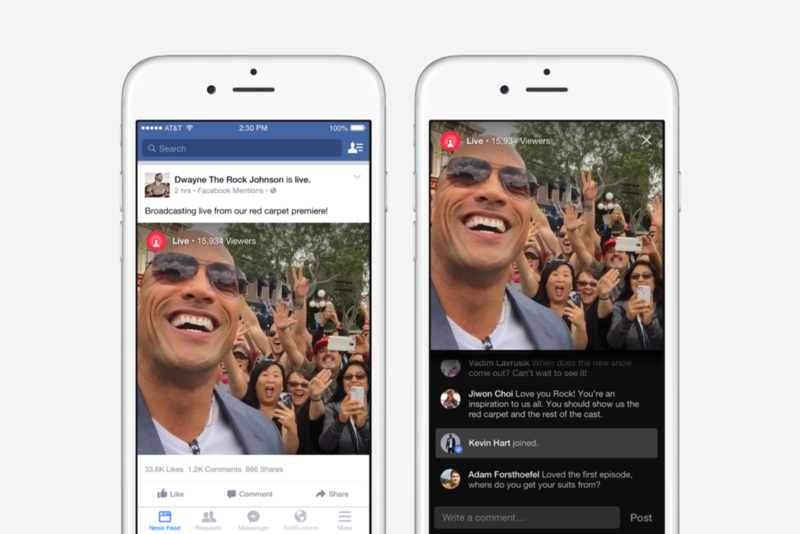 Facebook Live events get special attention on news feeds. That’s right — if you’ve never heard or noticed this before than you can rest assured that the Facebook algorithm does in fact give preferential treatment to live video content. This in part can be inferred by its prominent placement on our newsfeeds and in our alerts, which often highlight live video events in a more attention-grabbing fashion. Two years ago in March of 2016, the company made the official decision to update the algorithm to give preference to live video due to the levels of engagement that were being observed once it had been officially implemented. In a keynote interview at the Mobile World Congress, Mark Zuckerberg discussed his vision for the concept of Facebook Live by addressing it as a means for people to have more authentic and intimate connections and experiences in sharing about their lives. Obviously, businesses can learn a lot by taking this same concept and applying it to their outreach strategies. 4. Facebook Live gives you the opportunity to show your audience something new. Whether you’re new to the concept of live streaming in general, you’ve already dabbled in it or you have a full-on live video content strategy — there’s always room for expansion and novelty. Entrepreneurs and businesses new to the concept of live streaming will enjoy the benefits of higher engagement levels and its ability to generate higher quality leads than other more traditional forms of social media content. They’ll also appreciate the fact that they’ve tapped into a new and extremely valuable resource for connecting face-to-face with their audience demographic. 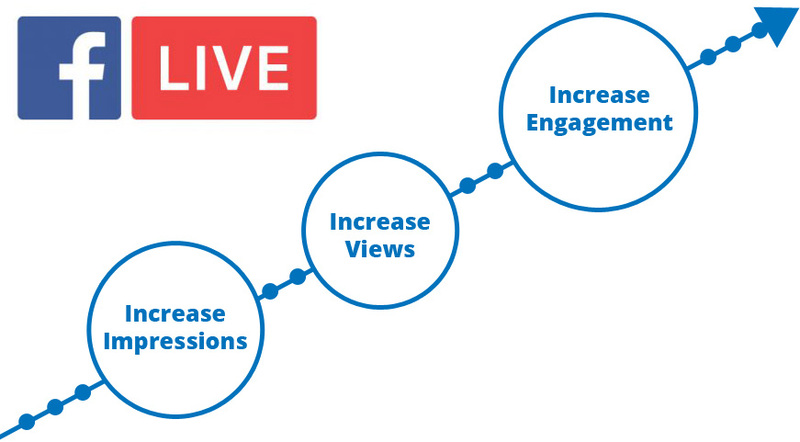 Those who dabble in live video will find that they can become more effective in their efforts by moving forward with novel actions such as documenting their content strategy, coming up with consistent broadcasting dates and times and creating an engaging content schedule of topics and events based on their viewership preferences. Those with full-on live video content strategies can seek novelty through experimentation with different angles of approaching their live feed. Product demos, Q&A’s, open discussions, lectures, contests and giveaways are all ways brands can “switch it up” and find new and interesting ways to bring value to their audience. 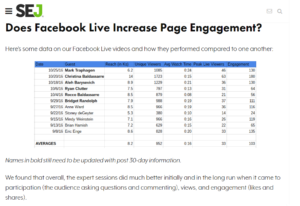 That’s right — did you know that you’re much more likely to get higher engagement levels on live video than you are on other traditional forms of Facebook content? This isn’t just a postulation — it’s proven. According to one blog post by the company, “people spend on average three times as much time watching Facebook Live video as they spend watching other video content.” People have a higher propensity to engage with live video content — point blank. There are undoubtedly a multitude of reasons behind this desire. 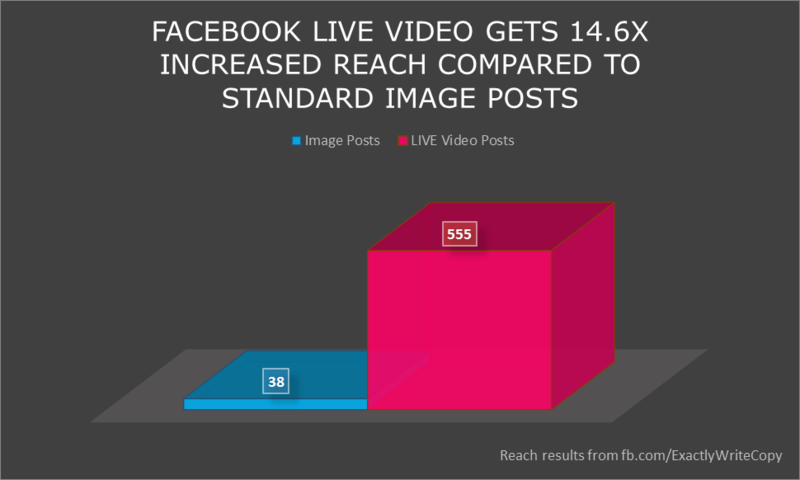 For instance, the mere fact that live video is a relatively novel concept in mainstream social media networks definitely works towards your advantage and Facebook’s preferential algorithm updates also play a huge role. Furthermore — it’s a much more authentic manner of connecting with your audience who desire organic, socially conscious businesses. 6. Facebook Live puts your audience in the driver seat. This is a really special one. Facebook live is a wonderful marketing and promotions tool because it gives you the opportunity to put your audience in the driver seat. Sounds a little scary, right? Well, that’s exactly the feeling you should be constantly striving to feel as an entrepreneur. Discomfort is the catalyst to progress and growth and letting go of the reigns and letting your audience “choose their own adventure” and shape the experience is an extremely rewarding endeavor. Why? Wowza Media Systems put it perfectly when they said that it takes a “superior user experience to engage today’s media-saturated audiences.” The truth of the matter is that you’re out there trying to gain attention and leverage in an industry that is filled to the brim with a sea of competition. Pretty much everything that can and should have been done — already has been by someone else. So you have one of two options — you can find a way to do something completely different, or you can do the same thing that others in your industry are doing, except do it better by adding a unique perspective, angle or twist. So why not put your audience in the driver’s seat? Let your audience shape your content based on interactions and create content that they’ll want to interact with. Facebook offers engagement-oriented features such as Live Reaction emojis and real-time comments to help foster this concept of an interactive experience. So, get feedback, get comments, ask questions about what subjects to discuss next, events/activities they would be interested in or individuals they’d love to hear from and use this feedback to build highly-personalized, valuable content for your audience. 7. 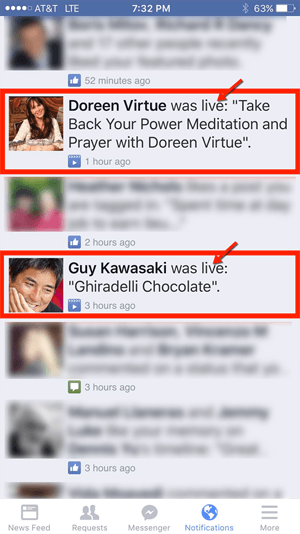 Facebook Live facilitates effortless cross-promoting. Facebook Live is a great way to cross-promote any events, activities or materials that you’re interested in drawing attention towards. The fact that live video is inherently interactive means that it has a higher propensity to bring in better engagement than other forms of content such as generic posts or even dated video content. Many broadcasters tag experts, influencers or brands that are involved with or related to the purpose of the discussion at hand in the comments section. You can also include trending hashtags, Twitter handles or various links to leverage the traffic received from your live stream and redirect it towards your own branded content such as your website, Facebook page, other social media sites or forms of content, events or activities. For example, Search Engine Journal (SEJ) has a live segment called SEJ News Live where they make sure to link all of the articles mentioned on the broadcast by the host Caitlin within the comments section. 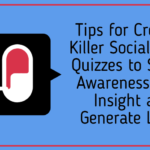 This not only promotes engagement but boosts it and drives both awareness and traffic to these other areas, activities or forms of content as well. 8. Facebook Live lets you report breaking news. Using Facebook Live is a great way to leverage the interest of matters of a more urgent nature such as industry breaking news, current affairs or recent updates within your company. Being able to keep your audience up to date on important matters as such also helps cement your status as a thought leader or influencer within your field. Keeping your audience posted on breaking news and trends demonstrates that you are highly conscious of your audience and their potential needs and desires. It shows that you are empathetic to their circumstances and quests for knowledge and that you’ve taken the time to not only be considerate of their position in the industry but are also actively seeking to bring them value and keep them informed. In essence — keeping your audience up to date on topics, trends and news in your niche builds establishes credibility, authority and builds trust. 9. Facebook Live gives you the ability to collab with brand advocates. Facebook live is an awesome opportunity to collaborate with brand advocates and influencers to help expand your reach and show off your industry connections. However, it’s important to mention that this should be done in a most humbling manner as all forms of gross promotions or advertising should be vehemently avoided with this content form. Influencers in your industry can range anywhere from well-known industry names, journalists, viral sensations, thought leaders or other fellow entrepreneurs in your area of expertise looking to be heard and bring value to their audiences. Many of you may already be aware of Tough Mudder, the brand that popularized high endurance, obstacle events. They have a wonderfully loyal community and used their live stream to feature an inspirational speech by a renowned trainer by the name of Kyle Railton, aka Coach T. Mud. The result? Their viewership has skyrocketed and their live events garner millions of views. Using this method of collaboration is extremely effective because it provides your audience with social proof of your activities within your field. 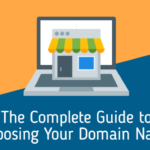 Tools such as Buzzsumo can also help immensely in your ability to hone in on the right names to help increase the effectiveness of your efforts. 10. Facebook Live gives you killer insights. The platform offers a robust amount of metrics and video summary data for those interested in gaining for their insight into the performance of their content. 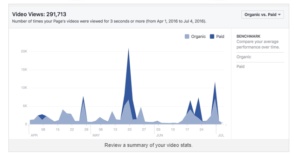 Stats on your video data can be accessed by going to the top of your Facebook business page, clicking on Insights and then Videos. 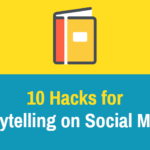 Users also have the ability to view total views or 10-second views of their content. This 10 second filter shows how many people watched 10 seconds or more of your video content on any single given day. 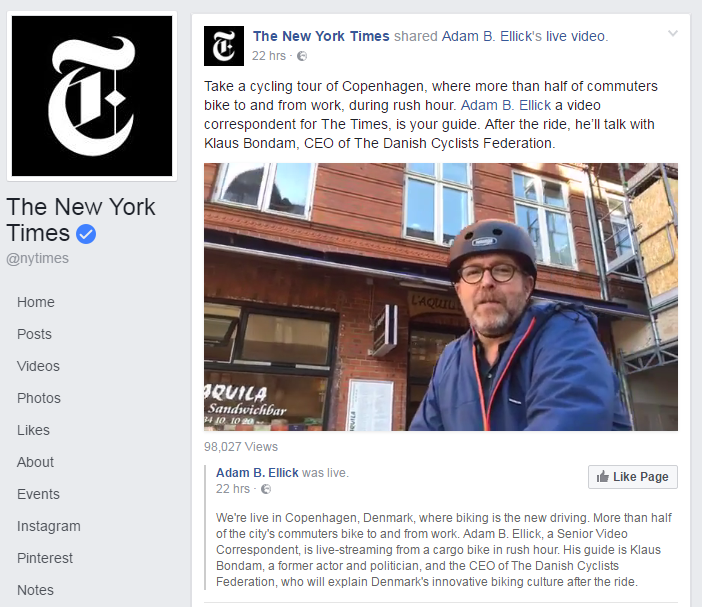 The 10 second benchmark was put into place because a standard video of you and the news feed is just 3 seconds long regardless of whether it is auto-played or clicked-to-play. Users are also able to get a robust set of stats on individual videos as well as see them in reverse chronological order. Users are also able to check out their completion rate of their video content. While ideally, we are all looking for a high completion rate, the truth of the matter is that low completion rates are quite normal according to Social Media Examiner, even on short videos. This means that if you receive a high completion rate of 25% or higher, you’re doing something well (better than average), so checking in on which percent of this data is auto-played versus clicked-to-play will give you some powerful insight. 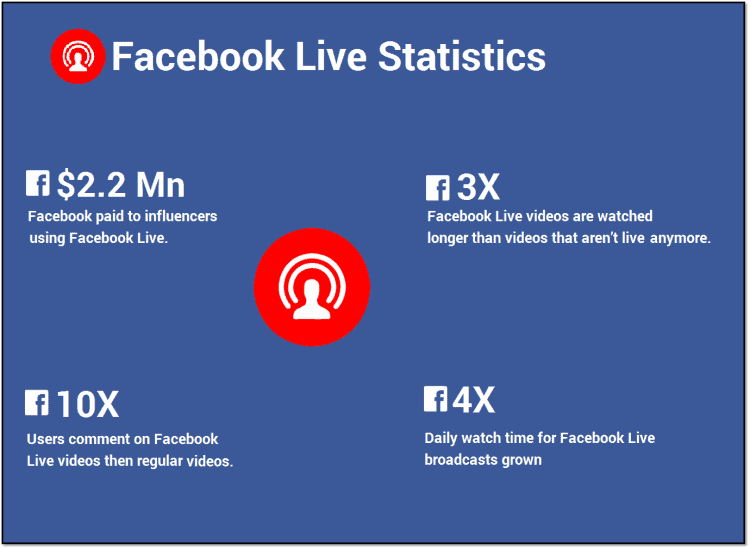 Live video is one of the hottest marketing trends in 2018 and as a result, Facebook Live is absolutely on fire. If you’re a business, brand or marketer interested in taking advantage of this awesome social media tool, then we hope that ythis article has given you greater insight into various ways in which you can harness it to help further your strategic goals and achieve higher ROI in your marketing efforts. So take some time out of your work week to do something different with your marketing approach. Whether you’re completely new to the concept of live video, you already dabble in it, or you have a full-on documented strategy for your live video efforts, there’s always room for improvement, novelty, and getting more in tune with the pulse of your target demographic.